One of the things I love most about my ever present sketchbook is that it preserves ideas for later inspiration. Sometimes bringing a vision to fruition can take a while. I first drew the treetop beads on October 15, 2009, almost two years ago. 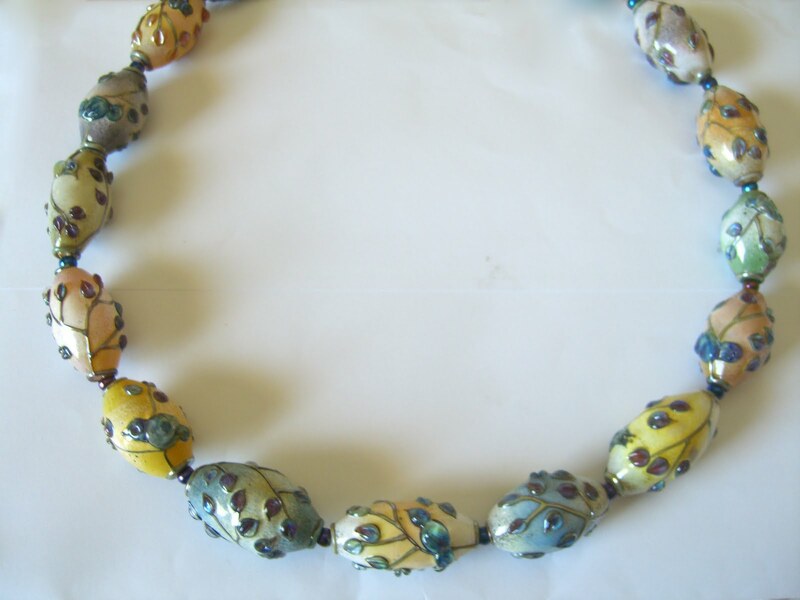 I envisioned a necklace of various soft colors with unifying silver glass stringer. Of course, I found that I couldn't make those beads, because the process of reducing the silver glass stringer would produce metal fumes that would change the color of the base bead. I struggled for ages, trying every color I could reach. Sky blue and copper green were less susceptible to the fuming, while a few other colors transmuted to something tolerable, but most just turned sickly brown. Finally, after probably a hundred beads, I stumbled upon a way to finally make the beads of my vision. 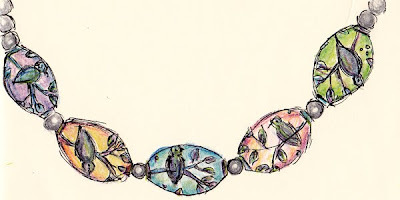 And the necklace looks remarkably like what I drew! I didn't take a very good photo, but there is a bird on every bead (at least one). I sold many of the best treetop beads during the ISGB Gathering Bead Bazaar on Saturday, so I need to make a few more to put the necklace together in the way I desire. Colors available: goldenrod, apricot, peach, orchid, lilac, gray, kiwi, lime, sky. I think I'll go revisit my sketchbook for more good ideas long past due. Very nice Vickie! I'd love to see detail photos. I use a sketch book too. I don't think I could function without one. Really pretty, Vickie! Sometimes perseverance really pays off! I love it. I use a sketchbook, too and find that looking back is like finding lost inspiration. I used to forget to date my drawings, but now do it every time. What a beautiful fruition of your idea!